The Marianne Boesky Gallery is currently presenting the solo exhibition “Julia Dault: More Than Words. Using industrial materials”. Dault has created a series of wall sculptures that explore the distortion of parallel lines. 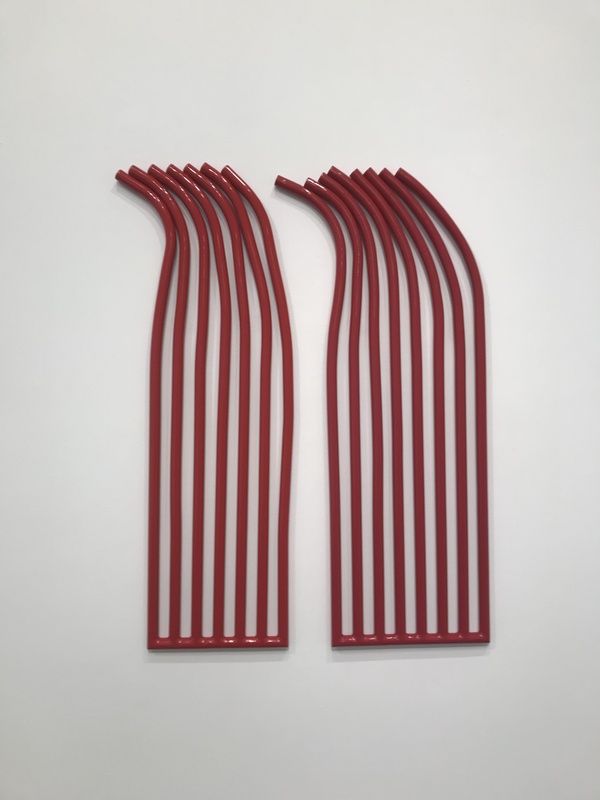 In the sculpture “Cherry Bomb” from 2018, made of powder coated hand-rolled aluminum, the two figures each consist of a series of vertical parallel straight lines joined at the bottom by a horizontal bar but as the lines get higher they start to warp and bend. “Blue Angel” also from 2018 is a lozenge shape where part of the form has a covertness quality with each line equal distance apart. By pushing the lines closer together in the top left section Dault has created an irregular shaped negative space in the center. altering the distance between the rings creates a sense of movement. Although Roy Colmer was well known for his photographic work, in the late 1960’s and early 1970’s he produced a series of paintings on canvas. 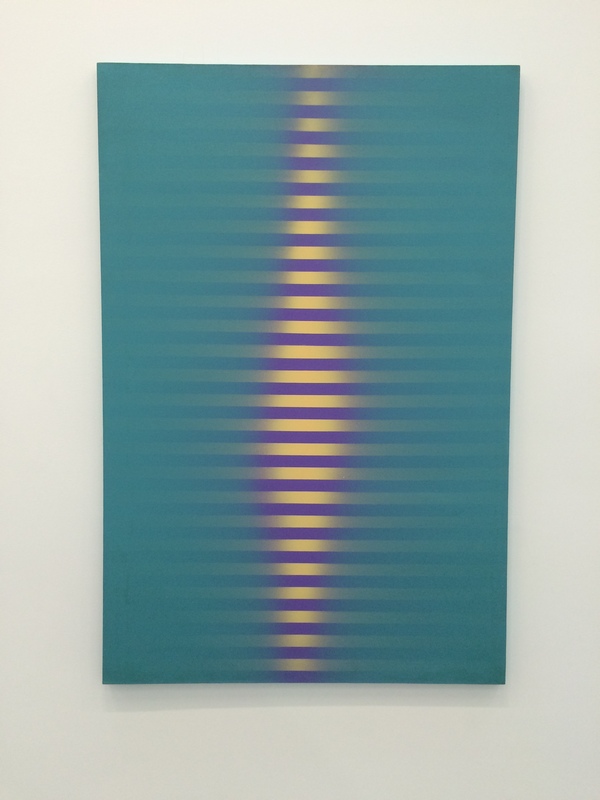 Currently on display at Lisson Gallery, this work was created by using tape to make bright horizontal bands of color, that where then painted over using a spray gun. The practice of spraying a mist of paint applied a gradient of opacities over the hard-edge parallel lines. The resulting optical quality of the work relates to Colmer’s use of – what he referred to as – “feedback” in his film and video work. These techniques seem to bend and distort the canvas plane altering the nature of the parallel line. Terry Haggerty at Sikkema Jenkins & Co. The Fall season is in full swing in the New York art world. 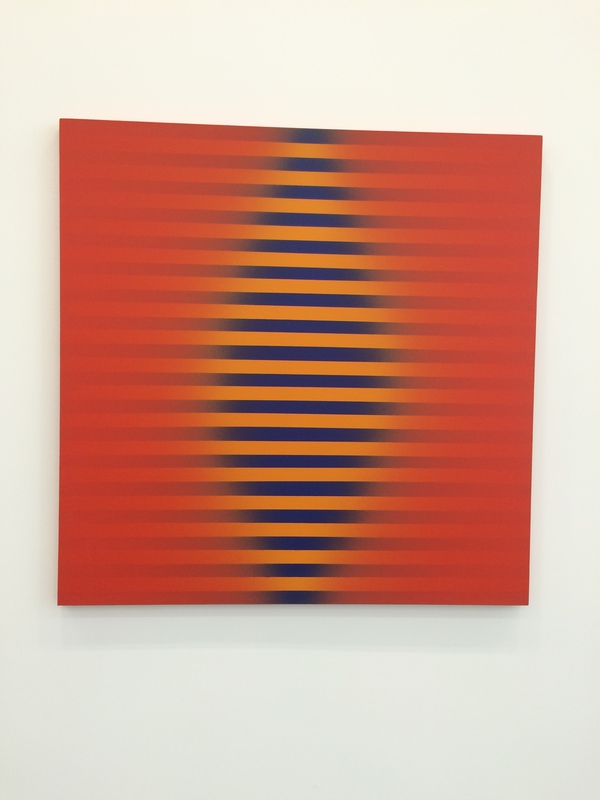 All of the galleries have opened fresh shows and I am continuing my Math/Art treasure hunt. 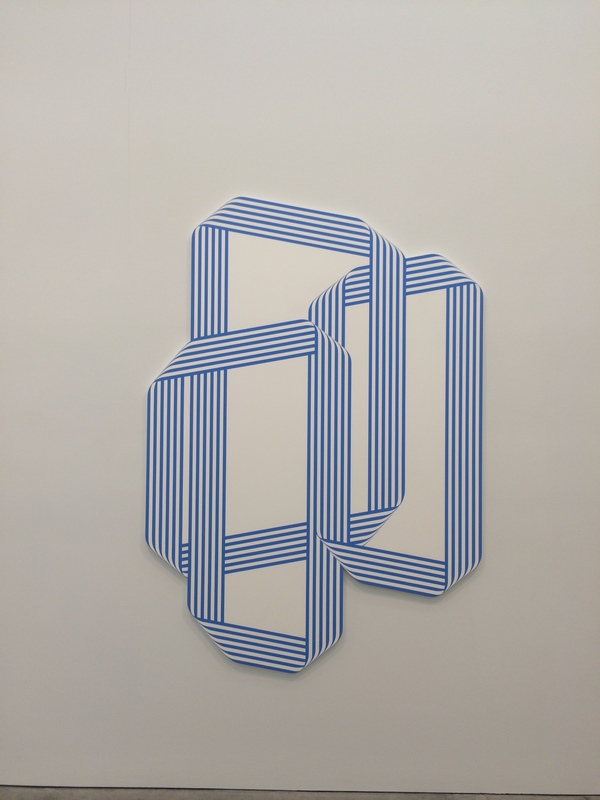 The Sikkema Jenkins & Co. gallery in Chelsea is exhibiting the brand new work of Terry Haggerty. A virtuoso of parallel lines, Haggerty is able to create an illusion of depth without the use of shading. Although the paintings are on flat panels of wood, the ribbons of line seem to bend and fold. Haggerty’s technique of using hard edge lines creates an optical paradox as his forms seem to loop through space. 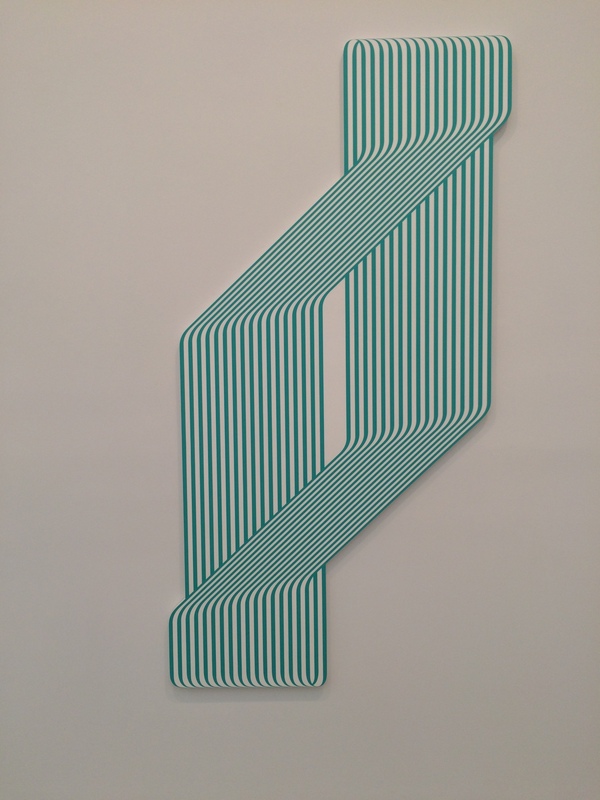 The painting “Torque” depicts a closed loop that appears to be twisting around itself. 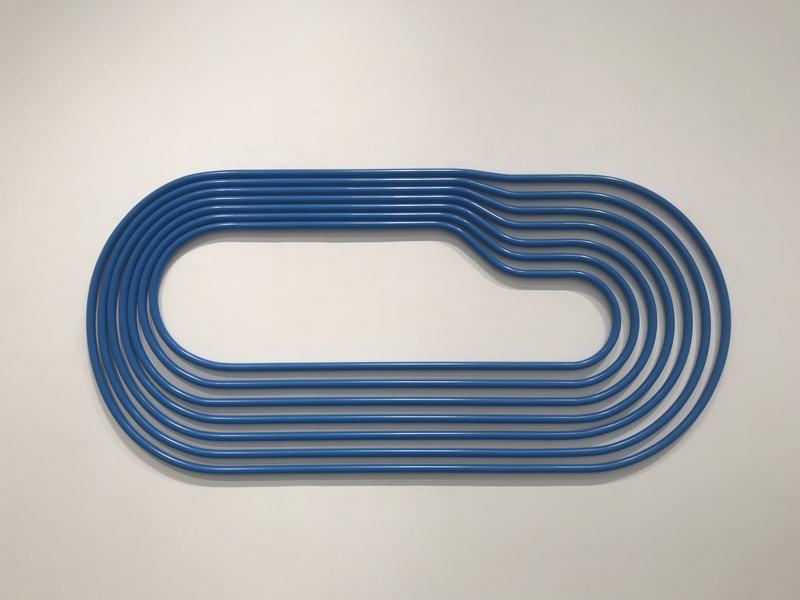 “Easily Lost” is one of the most complex structure in the exhibition.The ribbon of parallel lines is thinner than in other paintings and the loop is arranged in a circuit three overlapping rings. 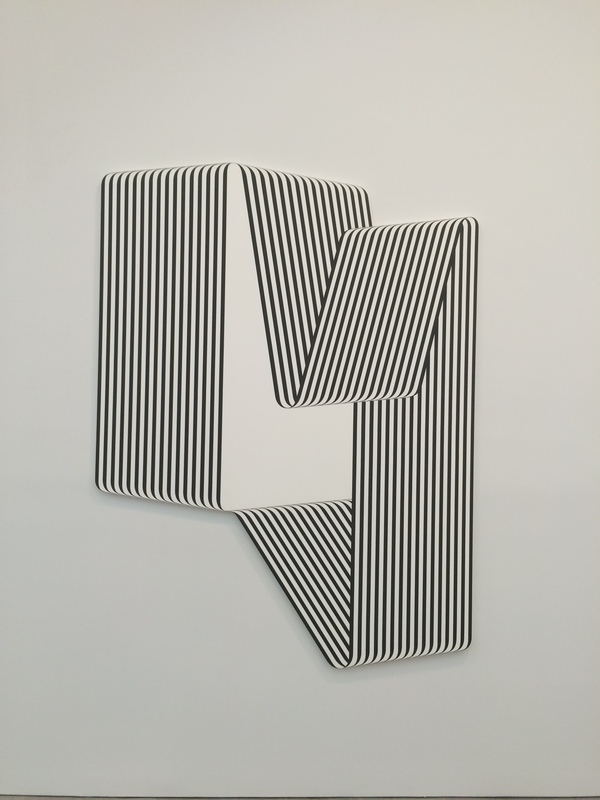 Haggerty uses the vocabulary of Hard Edge and Minimalist painters from years ago, but by incorporating parallel lines he has allowed his geometric forms to optically leave the 2-dimensional plane.